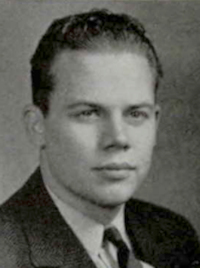 Obituary – Kehres, Paul George « Perry High School Alumni Association, Inc.
﻿- son of Mr. and Mrs. W. F. Kehres of Perry, was born in Perry on Oct. 9, 1917. Kehres attended the elementary grades at the St. Joseph Academy in Perry and attended Perry High school During his high school career he played basketball and football. Following graduation he expects to attend college. Paul G. Kehres, 53, 1310 Fir avenue, died at 3 a.m. Sunday in St. Mary hospital, Enid, which he entered Thursday. Rosary will be at 7:30 p.m. Monday in Parker chapel and funeral will be at 10 a.m. Tuesday at St. Rose of Lima Catholic church. Rev. Anthony Dockers will officiate and burial will be in the Catholic cemetery. Kehres, who had been in ill health two years, was born Oct. 9, 1917, in Perry. He graduated from Perry high school in 1937 and Notre Dame university, Evansville, Ind., in 1941. He was a member of St. Rose of Lima Catholic church and was a veteran of World War II. Kehres was a hotel manager from 1954-1970, and had been employed the last several months by R. L. Frailey Inc. He is survived by one daughter, Deborah Lynn Kehres, of the home address; and two brothers, Robert J. Kehres, Magnolia, Ark., and Walter L. Kehres, Perry.